A train passes by a mining town, where a woman calls to her young son, John, as the light fades to dusk. He joins her sullenly, pulling at the chrysanthemum bushes as they walk towards the house. The mother tells her son to stop, before plucking a branch of flowers to smell and tucking them into her waistband. The mother and son wait at the foot of the steps, watching miners heading home after a day of work. The train comes to a stop before their gate, and the engine driver, the woman's father, calls out to ask whether she has a cup of tea. The woman prepares some tea, bread, and butter, and she exchanges words with her father, expressing disapproval of his hasty remarriage. Her father defends himself and mentions that he heard news of Walter, the woman's husband, spending his money in pubs. The woman bitterly acknowledges that this news is very likely true. The woman's father pulls away in the train, and the woman, Elizabeth, enters the house and begins preparing the family's tea. Meanwhile, the day darkens, and there are fewer and fewer miners passing by on their way home. A young girl enters the house, and Elizabeth chides her for coming home late. Annie, the girl, responds that it's hardly dark out yet. Elizabeth asks Annie whether she's seen her father, and Annie responds that she hasn't. Elizabeth bitterly replies that he probably snuck by Annie on his way to the pub. Annie sits before the fire, admiring the flames. Her mother tells her that the fire needs to be tended to, or else her father will complain that the house isn't warm enough when he returns. As Annie tends the fire, John complains that she isn't working quickly enough. The children eat as Elizabeth drinks her tea, growing angrier as she waits for her husband. She puts coals on the fire, and John complains that it's too dark. Elizabeth lights a lantern in the middle of the room, revealing her stomach, rounded with pregnancy. Annie, upon seeing the chrysanthemums, gasps at their beauty and goes to smell them. Elizabeth says that chrysanthemums no longer smell beautiful to her because they were present when she married Walter, when she gave birth to Annie, and when others first brought Walter home drunk. Elizabeth sews as the children play, and eventually, she sends them to bed, promising that there won't be a scene when their father returns home. She continues to sew, growing worried as she waits. When the clock strikes eight, Elizabeth goes outside and walks to town, consulting another miner's wife, Mrs. Rigley. Mrs. Rigley goes to ask her husband whether Walter is in the pub, "Prince of Wales," while Elizabeth waits in the Rigleys' untidy home. When the Rigleys return, Jack Rigley admits that he left Walter finishing up a stint at the mine. He walks Elizabeth to her home before he leaves to search for Walter. Elizabeth waits, growing more and more anxious, when she hears a pair of footsteps at the door. Walter's mother enters the house, moaning. Jack Rigley told her that Walter had an accident, though she doesn't know how serious it is. When the men come to the door, Elizabeth is informed that Walter is dead. Walter's mother reacts hysterically, but Elizabeth warns her not to wake the children. The men bring Walter's body into the parlor, knocking down the vase of chrysanthemums, which Elizabeth cleans up. The noise wakes Annie, and Elizabeth goes to comfort her, while the men tiptoe out of the house. When Elizabeth returns to the parlor, she and Walter's mother strip and wash the body, as Walter's mother reminisces about Walter's childhood. Elizabeth realizes suddenly how far removed she and Water were, even in life. She acknowledges that she also played a part in the dissolution of their marriage because she never recognized Walter for who he truly was. After the women finish dressing Walter, Elizabeth locks the parlor door and goes to tidy the kitchen. She's aware that she must tend to her current master, life, but she fears death, which is the ultimate master. Cao, Diana. 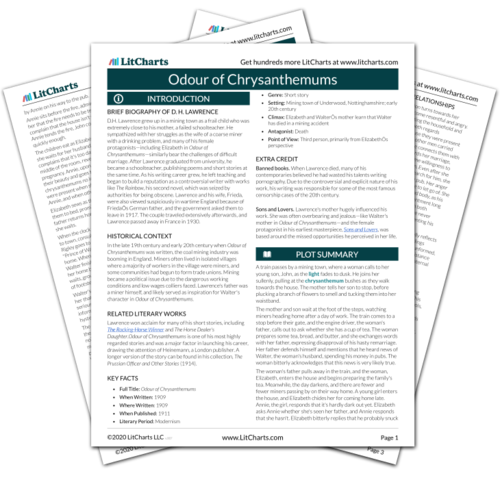 "Odour of Chrysanthemums Plot Summary." LitCharts. LitCharts LLC, 5 Jan 2014. Web. 25 Apr 2019. Cao, Diana. "Odour of Chrysanthemums Plot Summary." LitCharts LLC, January 5, 2014. Retrieved April 25, 2019. https://www.litcharts.com/lit/odour-of-chrysanthemums/summary.